Air conditioning fan heaters – AFR | Pak Plant Ltd. 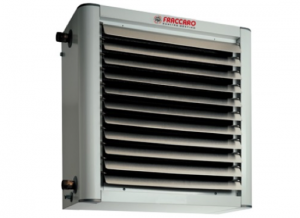 In line with recent HVAC trends, FRACCARO offers a universal unit for medium-sized and large industrial and commercial buildings which combines year-round heating and air-conditioning functions. Distinguishable by its original rounded shape, AFRA stands out above all for its technical features (all models are equipped with three-speed motors and configured for operation with chilled water) and one of the lowest noise levels you will find in the market. The AFRA series comprises 18 models, all designed to be wall mounted (horizontal air flow) and to operate with hot water and chilled water, thanks to an innovative condensate collection and drainage system. If used for heating only, AFRA can also be ceiling mounted (vertical air flow). The units are available in 6 sizes with 2-, 3- or 4-row heat exchangers ensuring an efficient performance with hot water supplied by a boiler or heat pump (4-row models).